Solorzano-Meza Jose Luis1,2, Meza-Montenegro Maria Mercedes1,⃰, Mondaca-Fernandez Iram1, Gortares-Moroyoqui Pablo1, Vega- Millan Christian Beatriz1,2, Balderas-Cortes Jose de Jesus 1, ⃰. 1Instituto Tecnologico de Sonora. 5 deFebrero 818 sur, Cd. Obregon, Sonora, Mexico. 85000. 2Programa de DoctoradoenCienciasEspecialidadenBiotecnologia. Departamento de Biotecnología y CienciasAlimentarias, InstitutoTecnologico de Sonora. 5 deFebrero 818 sur, Cd. Obregon, Sonora, Mexico. 85000. *These two authors contributed equally with the manuscript. Superficial water and sediment samples were collected from Bahia de Lobos in Sonora. This is the first work to describe the analysis of heavy metals in water of Bahia de Lobos including the measurement of Arsenic and Mercury. We determined Lead (Pb), Cadmium (Cd), Copper (Cu), Arsenic (As) and Mercury concentrations. This estuary was sampled monthly from May to December of 2016, and samples were analyzed by Atomic Absorption Spectrometry (AAS) and AAS coupled to Hydride Generation. The levels of metals found in water were:Pb (1080 µg L-1), Cu (104 µg L-1), Cd (80 µg L-1), As (<LOQ: Limit Of Quantification), Hg (<LOQ). Lead exceeded the Mexican regulatory limits (200 µg L-1) for Protection of Aquatic Life (PAL). Cd exceeded the established values (3.9 and 1.0 µg L-1) by the USEPA for the Protection of Aquatic Life Fresh Acute Criteria (PALFAC) and the Canadian Council of Ministers of the Environment (CCME) respectively, as well as the level permitted by the Protection of Aquatic Life Marine Acute Criteria (PALMAC) (0.12 µg L-1). Copper (104 µg L-1) was above the USEPA in PALFAC (18 µg L-1). Levels of Pb (1.85 mg kg-1), Cd (<LOQ), Cu (4.52 mg kg-1), As (1045 µg kg-1), and Hg (2.76 µg kg-1) were also found in sediments. Pb exceeded the International Legislation according to the Screening Quick Reference Tables (US-SQUIRTS) established for mammals (0.0537 mg kg-1) and Hg exceeded PALFAC (0.17 µg kg-1), PALMAC (0.13 µg kg-1), and SQUIRTS for invertebrates and plants (0.1 and 0.3 µg kg-1). Only temporal differences for Pb in water (P= 0.0270), and for Cu in sediment were found (P= 0.0000), while As presented spatial temporal differences in water and sediment, respectively. Consequently, the metal levels found in water and sediment from Bahia de Lobos might cause potential adverse effects in the biota and it is necessary to work with the Mexican legislation to prevent further contamination in the Bahia. Estuaries are considered to be a sink for chemical substances which can adhere to particulates suspended in water and then deposit in sediments, repeating the process cyclically [1-2]. Estuaries and coastal areas exhibit human caused pollution that compromises their ecological integrity [3-6]. The bays provide biological protection for endemic species and serve as breeding and nesting sites as well. Bays are the final recipients of human pollution but also provide food for humans and trace elements can return into the human diet by biomagnification, through the trophic chain . Trace elements occur naturally in the environment, but various human activities such as mining, industry, and agriculture increase their concentration [8-10]. Pb and Cd tend to accumulate in the bone structure of organisms due to their chemical similarity to calcium, causing a decrease in the quality of life of marine organisms at low exposure levels. In addition, they cause chronic adverse effects in the reproductive system [11-17]. Arsenic is carcinogenic and considered the most toxic element, damaging the nervous and vascular systems [18-19]. Hg has the ability to move from the sediment into the water and as it is lipophilic, is bioaccumulated in the reproductive and nervous systems, mainly in the brain [20-21]. Cu regulates some natural functions in the marine biota working like an enzyme necessary for living organisms . However, it has been reported that at concentrations between 10-15 times higher than the required levels, it produces adverse effects in aquatic organisms . The importance of monitoring metal levels in sediment is that the metals adhere to the particulate matter, accumulating over time and are re-suspended into water with the tidal cycles, and become bioavailable to organisms in the marine environment [24-26]. Recent studies carried out in a variety of countries (Venezuela, Argentina, Canada, Tunisia, Pakistan, Egypt, France, China and Russia) have shown that heavy metals are chemically very stable, i.e. they do not degrade over time. On the contrary, their presence increases over time in sediment, water, soil, air and biota [27--35]. In Mexico, very few studies of heavy metals in water and sediments from estuaries have been reported since 1980. Cadmium (0.60 mg L-1) was found in water from Laguna Madre Tamaulipas by Pulich (1980) . González-Lozano et al. (2006)  reported Cu (2.06 mg kg-1), Pb (3.3 mg kg-1) and Cd (937.5 mg kg-1) in sediment at Salina Cruz, Oaxaca. Celis-Hernández et al. (2017)  determined Pb (17 mg kg-1), Cu (25 mg kg-1) and As (14 000 µg kg-1) were present in sediment from Veracruz, and Botello et al. (2018)  detected concentrations of Pb (40.35 mg kg-1), Cd (0.0417 mg kg-1), Cu (52.59 mg kg-1) and Hg (210 µg kg-1) in sediment, which represents the contamination from these elements for the last 40 years. Sonora is located in northwest Mexico and borders the United States to the north. It is located in the Pacific basin and is bounded on the west by the Sea of Cortez . Bahia de Lobos is located in southern Sonora on the eastern coast of the Gulf of California and is the main commercial source for fish in Sonora. Additionally, this bay is the final discharge area of the three major waste water channels (agricultural, domestic and industrial) that come from the city of Obregon and from the primary Yaqui communities. Ciudad Obregón and the Yaqui communities treat only a 9.5% of the wastewater Gortares-Moroyooqui, (2010) . As a consequence, the biota from this bay is in constant environmental stress from the introduction of various pollutants. Bahia de Lobos has four types of mangroves, species protected by Mexican Legislation which are of global interest for their key role in the reproduction cycle of some marine species, e.g. shrimp . Studies of the presence of metals in this area are scarce. One of the most recent was conducted by Vargas-Gonzalez et al. (2017)  who found Pb, Cd and Cu in sediments of Bahia de Lobos. The reported concentrations were 18.5 mg kg-1, 1.22 mg kg-1 and 16.30 mg kg-1 respectively. Ortega and Vasquez (1992)  carried out a study of sediment from the Bahia de Lobos, quantifying Pb and Cu levels, and found 59 mg kg-1 and 88 mg kg-1 respectively. García-Rico et al. 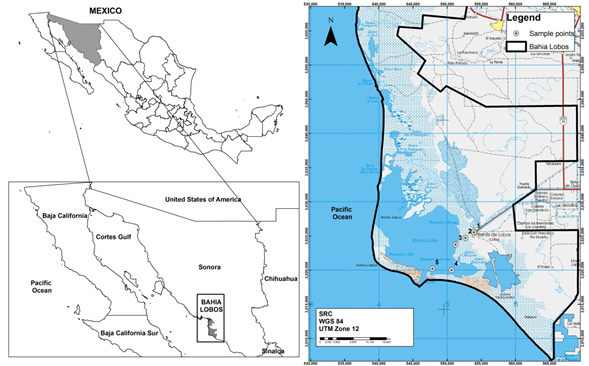 (2004)  analyzed metals in oyster culture areas, in the Northern and Central coasts of Sonora, quantifying heavy metals in sediments, and detecting the highest concentrations in Guaymas, Sonora ( Cu 14.85 mg kg-1; Cd 5.62 mg kg-1; and Pb 46.55 mg kg-1). Due to the scarcity of studies of the negative impact that these metals are causing in the biota of the Bahia de Lobos, the goal of this study was to analyze the concentration of the most toxic trace elements, As, Hg, Pb, Cd and Cu in sediments including for the first time determination of levels of arsenic and mercury, and the analysis of the study metals in water from bahia de Lobos. Bahia de Lobos is located in south Sonora, Mexico (Figure 1), and has an area of 11, 978 ha. The estuary is considered of great biological importance because it has four mangrove species at risk of extinction according to the Official Mexican Norm , and serves as a safe place for reproduction and nesting of endemic and step species. Bahia de Lobos has an average annual fishery production of $37,500 per hectare of mangrove . Figure 1. Sampling sites in Bahia de Lobos, Sonora. Five points (latitude and longitude P1:27°21'7.59"N,110°27'17.68"O; P2: 27°20'40.75"N, 110°28'2.80"O; P3: 27°20'9.99"N, 110°28'54.97"O; P4: 27°18'8.18"N, 110°29'16.96"O; P5: 27°18'14.66"N, 110°30'59.31"O) of the bay were selected for monthly sampling based on the estuarine area (Fig. 1). The collection of sediments and water samples was done from May to December, 2016. The points were strategically chosen and marked with a GPS Garmin, model ETrex 10, to establish the temporal space distribution from the point of discharge. The top 10 cm of surface sediments were collected using a plastic shovel and placed in a 500 mL polypropylene flask. Samples were transported in coolers at 4 °C to the Laboratory of Toxicology and Public Health at the InstitutoTecnológico de Sonora. The sediment was dried at 45 °C in a Model 107800 Boekel Scientific Oven and then ground with a mortar and pestle and packed in polyethylene bags at -20 °C until the analysis could be completed. The surface water samples were collected using a 500 mL polypropylene flask and transported in coolers at 4 °C to the Laboratory of Toxicology and Public Health at the InstitutoTecnológico de Sonora, using protocol established by Mexican Legislation . All glassware used for the metal analysis was previously soaked in 10% HNO3 (v/v) and rinsed with deionized water. For sediment chemical analyses, five grams of dried sediment were placed in a 250 mL Pyrex volumetric flask, a total of 20 mL of concentrated HNO3 grade Omnitrace was added to the flask and placed on a heating plate for digestion according to the Mexican Norm . Then 5 mL of nitric acid were added intermittently to digest the sediment completely until the supernatant became amber-clear. When the sample was nearly dried, the solution was filtered through a 0.42 µm membrane into a 100 mL Pyrex volumetric flask and then filled with deionized water. For water chemical analyses, 30 mL of water were placed into a 250 mL Pyrex volumetric flask, a total of 20 mL of concentrated HNO3 grade Omnitrace was added to the flask and placed on a heating plate for digestion according the Mexican Norm . Then 5 mL of nitric acid were added again to digest the water until the supernatant became amber-clear. After the sample was nearly dried, the solution was filtered through a 0.42 µm membrane in a 100 mL Pyrex volumetric flask and filled with deionized water. After sample digestion, Pb, Cd, Hg and Cu were determined to be present by Atomic Absorption Spectrometry (AAS). As and Hg were analyzed using Hydride Generator (HG) coupled to AAS equipment. The presence of Arsenic was determined by flame and Hg by cold vapor according to the Mexican Norm [47-48]. For quality control the duplicate samples were analyzed and three blanks and three spikes were prepared for every 10 samples analyzed. The sediment recoveries for the metals ranged from 95.1 to 106.79%, and the variation coefficients (CV) values for the metals Cu, Cd, Pb, As and Hg were 0.42, 0.46, 27.13, 8.51 and 6.58%, respectively. The water recoveries for heavy metals ranged from 90.75 to 104.25%, and the CV values for Cu, Cd, Pb, As, and Hg were 0.28, 1.59, 9.60, 3.07 and 4.23%, respectively. Measures of central tendency of the levels of metals in the water and sediment were obtained. To compare the metal concentrations with the sampling points and months, a factorial of 95% ANOVA was used. Later, in the cases in which a statistically significant difference presented, a media difference analysis (Fisher LSD) was carried out using STATGRAPHICS Plus software for Windows 5.1 . The mean levels of metals in the water samples from Bahia de Lobos, Sonora, are shown in Table 1. The mean concentration of Pb was 1080 µg L-1, 2160 times higher than the value reported in Kola, Russia (0.5 µg L-1) by Moiseenko et al. (2018) , and 13.5 times higher than the levels reported in Cordoba, Argentina (186.3 µg L-1) by Griboff et al. (2018) . Table 1. Comparison of mean metal levels in water from Bahia de Lobos, Sonora, Mexico, and other studies carried out around the world with the International Norms or Criteria for the protection of aquatic life. -/- Without information; -- No analyzed; LOD: Limit of detection; LOD-Hg:1.27 µg/L; LOD-As: 0.92 µg/L; LOQ: Limit of quantification; LOQ-Hg: 2.09 µg/L; LOQ-As: 3.3 µg/L; PAL: Protection of the aquatic life; PALMAC: Protection of the Aquatic Life, Marine Acute Criteria; PALFAC: Protection of the Aquatic Life, Fresh Acute Criteria; CCME: Canadian Council of Ministers of the Environment. The average level of Cd in the water was 80 µg L-1, 266 times higher than that found in Kola, Russia (0.3 µg L-1) by Moiseenko et al. (2018) . The average level of Cu detected was 104 µg L-1, 8.5 times higher than values found in Kola, Russia (12.1 µg L-1) by Moiseenko et al. (2018) , and 12.5 times lower than reported in Cordoba, Argentina (1300 µg L-1) by Griboff et al. (2018) . The concentrations of As and Hg in the water were below the limit of detection. There are few studies which report levels of these elements in water despite their important toxicity. Griboff et al. (2018)  found levels of arsenic at 1470 μg L-1 in Cordoba, Argentina and Sprague and Vermaire (2018)  detected 972 μg L-1 in Ontario, Canada. Perez-Zapata (1981)  reported 4 μg L-1 of Mercury, in Veracruz, Mexico. In our study, the average levels of Pb in the water were 1080 µgL-1. The average levels of Cd were 80 µg L-1, which did not exceed the Mexican Norm  (100 µg L-1) for Estuaries and Protection of Aquatic Life (PAL), but did exceed by 20.5 times the maximum established criteria (3.9 µg L-1) for the Protection of Aquatic Life, Fresh Acute Criteria (PALFAC) from United States Environmental Protection Agency (USEPA)  . The Cd levels exceeded the value established by the Protection of Aquatic Life and Fresh Acute Criteria (PALFAC) from Canadian Council of Ministers of the Environment (CCME)  by 80 times and were 666 times above the value established in the Protection of Aquatic Life and Marine Acute Criteria (PALMAC) from CCME  (Table 1). The Cu levels in the water were 104 µg L-1 and did not exceed the Mexican Legislation for estuaries nor the Mexican Guideline for the Protection of Aquatic Life (PAL) , but the value established by the USEPA-PALFAC  (18 µg L-1) was 5.7 times higher in the Bahia de Lobos (Table 1). The average values for metals in sediment samples from the Bahía de Lobos are shown in Table 2. The mean concentration of Pb in sediments was 1.85 mg kg-1, a value 4.7 times lower that the value reported in Cordoba, Argentina by Griboff et al. (2018) , [Table 2], and also 2.4 times lower than the levels reported in Lake Bourget, France (4.47 mg kg-1) by Lécrivain et al. (2018) [Table 2]. The average concentrations of Cd were below the limit of quantification (0.08 mg kg-1), but levels of Cadmium in the sediment have been reported in Cordoba, Argentina (0.0305 mg kg-1) and Lake Bourget, France (0.09 mg kg-1) by Griboff et al. (2018) and Lécrivain et al. (2018) respectively (Table 2) [30, 33]. The average concentrations of Cu in the sediment from Bahia de Lobos were 4.52 mg kg-1, 1.17 times higher than that found in Lake Bourget, France (3.86 mg kg-1) by Lécrivain et al. (2018) and similar to those reported in Cordoba, Argentina (5.6 mg kg-1) by Griboff et al. (2018) [Table2]. The mean concentrations of As in sediment from Bahía de Lobos were 1045 μg kg-1. Arsenic has not been monitored in most of the recent works, except in Argentina where a value of 1900 μg kg-1 was reported . This latter value was 1.8 times higher than the value found in this study. Mercury had an average level of 2.76 μg kg-1 in the sediment from Bahia de Lobos (Table 2). There are unfortunately no reports of the analysis of this metal in sediment in recent investigations, even though this element is considered bioaccumulative and neurotoxic, capable of causing serious damage to aquatic life. Only Griboff et al. (2018)  reported levels of 0.052 μg kg-1 of Hg in sediment from Cordoba, Argentina, a value 53 times lower than was found in this study (Table 2). Table 2. Comparison of mean levels of metals in sediment from Bahia de Lobos, Sonora, Mexico with the Mexican and International Norms for the Protection of Aquatic Life. *Concentration is in µg kg-1; -/- Without information; -- Not analyzed; LOD: Limit of detection; LOD-Cd: 0.02 mg/kg; LOQ: Limit of quantitation; LOQ-Cd: 0.08 mg/kg; ISQG: Interim sediment quality guidelines; PFAL: Protection of fresh aquatic life; PMAL: Protection of marine aquatic life; SQUIRTS: Screening quick reference tables; CCME: Canadian Council of Ministers of the Environment. The concentration of Pb in the sediment from Bahia de Lobos was 1.85 mg kg-1. In the absence of a Mexican regulation, this result was compared to International Guidelines, and was found to exceed by 34.4 times the value of 0.0537 mg kg-1 established by Buchman (2008)  as the threshold necessary for the protection of mammals (Table 2). Cd concentrations in sediment from Bahia de Lobos were below our limit of detection. The concentration of Cu was 4.52 mg kg-1, and did not exceed any International Norm from USA and Canada, but this value was close (5.4 mg kg-1) to the levels in Screening Quick Reference Tables (SQUIRTS) established for the protection of mammals (Buchman, 2008) . The As concentration in the sediment of Bahia de Lobos was 1045 μg kg-1, and did not surpass the value established for the Protection of the Aquatic Life by the Norms of the USA and Canada. The average concentration of Hg in sediment of this study was 2.76 μg kg-1, and exceeded by 21 times the established value (0.13 μg kg-1) by the Protection of Marine Aquatic Life (PMAL) of the Canadian Council of Ministers of the Environment (CCME)  and by 16 times the concentration establish (0.17 μg kg-1) by Protection of Fresh Aquatic Life (PFAL) of CCME . The concentration in the Bahia de Lobos was 27.6 times above the levels established (0.1 μg kg-1) by Buchman (2008)  in the SQUIRTS and 9.2 times the established value (0.3 μg kg-1) in the SQUIRTS for plants. The averages of metal concentrations in the sediments were higher than in the water, with the exception of the Cd which was higher in water. That is not surprising since these contaminants are found in higher concentrations adhered to the sediments and, with the tides, are re-suspended cyclically in the water. The behavior observed in this study is similar to that reported in the literature [1-2]. The metals present in the water exceed the Mexican regulations for the Protection of Aquatic Life, but in Mexico regulations for estuarine sediments do not exist. In the same way, the thresholds of the USEPA , CCME , and SQUIRTS  were surpassed. In these conditions, the marine aquatic life and freshwater species have been compromised because both marine and freshwater organisms live in the estuaries. These results may be due to the variety of contamination sources, for example, the lead present in gasoline and some pesticides in the 90’s, often present in automobile parts and paint, which wear out and leach into the environment, contamination from industry, and household waste generation. Some of these contaminants are transported and discharged into the Bahia de Lobos from the three major waste water channels which come from Obregon and some Yaqui communities. In addition, the levels of metals established by Buchman (2008)  in the SQUIRTS for mammals, invertebrates and plants were surpassed. These results showed that the trace metals found in Bahia de Lobos could generate adverse effects to living organisms. The spatial temporal variation of metal levels in water and sediment from Bahia de Lobos, is shown in Table 3. For water, statistically significant differences of Pb levels are presented by month (P= 0.0270), but not by sampling point. In July, the higher levels (2.54 mg L-1) were found and these values were statistically different from May (0.47 mg L-1), June (0.47 mg L-1), October (0.47 mg L-1), November (0.47 mg L-1) and December (0.47 mg L-1), but statistically equal to August (1.709 mg L-1) and September (1.835 mg L-1). On the other hand, for Cd, Cu, As and Hg, statistically significant differences in their spatial (sampling sites) and temporal (sampled months) concentrations were not found. In the sediment, Cu presented statistically significant temporal differences in its levels (P= 0.0000 ). Table 3, shows higher concentrations (18.93 mg kg-1) for July, and these levels were statistically different from May (0.007 mg kg-1), June (0.007 mg kg-1), August (4.25 mg kg-1), September (2.21 mg kg-1), October (2.16 mg kg-1), November (2.48 mg kg-1) and December (5.23 mg kg-1). For Pb, Cd, and Hg, statistically significant differences in temporal concentrations were not found. Arsenic presented a temporal statistically significant difference (P= 0.0119), as well as a spatial variation in its levels between the five sampling points: 3 (2.316 mg kg-1), 1 (0.555 mg kg-1), 2 (0.822 mg kg-1), 4 (0.885 mg kg-1) and 5 (0.0059 mg kg-1), respectively. The highest levels of Cu and Pb were detected in July (Table 3). July saw the heaviest precipitation in Sonora for the entire year as measured by the National Commission of Water . This could account for the high levels of metals, because of possible resuspension of sediments which would change the metal levels in the superficial water and sediment. For the same reason we detected the highest levels of Pb in December (sediments) because October to December low precipitation was recorded  and this influences the concentration of the metals in sediments. And the high Cu sediment levels in July can be affected by heavier precipitations removing the metals in sediments. Some can be detected in water and others has more affinity to particulate matter like Cu. Table 3. Means of metals concentrations in water and sediment from analyzed months of Bahia de Lobos. abcMeans with different superscripts indicate a statistically significant difference (P<0.050) LSD test. In spite of the fact that Cu does not exceed the limits allowed by Mexican regulations in water, it does exceed those established by the US-EPA and CCME. This means that Mexican regulations lag behind and expose deficiencies in the environmental care policies. In addition, the treatment plants in the area only treat 9.5% of the wastewater that reaches the site. This legislative omission is responsible for contaminants reaching the Bay which may be causing these elements to accumulate in the bone structure of the organisms and cause damage to their nervous systems. The Mexican legislation does not have a norm for heavy metals in sediments and thus, limits protection for the biota. The USA and Canadian norms were useful to fill the legislative gap in this work. Pb exceeds the protective threshold for mammals in SQUIRTS and thus can produce problems in their reproductive systems. Hg surpasses the limits set to protect marine aquatic life established by CCME and SQUIRTS for plants. This element is lipophilic and has affinity to nervous systems and can affect the cerebral synapses. It also exceeded the limit established for plants. It must be remembered that in Bahía de Lobos there are four types of mangroves, protected by national and international standards because of their great importance for the environment. This is because they are ecological niches of a great variety of marine species, and barriers that prevent pollution from reaching the sea in greater quantity. They are also generators of wealth in local and national economies. Continued monitoring of this bay is recommended as well as conducting a more exhaustive study including the endemic biota, to enable remedial actions if necessary. The authors would like to thank InstitutoTecnologico de Sonora for financing this study with the following generous grants: PROFAPI_ CA_2018-1145 and PROFAPI_2018_0030. In addition, thanks to Dr. Paul W. Kilpatrick for his support with the English edition. The publication of this manuscript was made possible with the support of the Program for Strengthening Educational Quality (PFCE), 2018. Turner, A., Le Roux, S.M., Millward, G.E. (2004). Speciation and partitions of cadmium and zinc in two contrasting estuaries: The role of hydrophobic organic matter. Limnology and Oceanography, 49, 11-19. Segura, R., Arancibia, V., Zú-iga, M.C., Pastén, P. (2006). Distribution of copper, zinc, lead and cadmium concentrations in stream sediments from the Mapocho River in Santiago, Chile. Journal of Geochemical Exploration, 91, 71–80. Kulikova, I., Seisum, Z., Legzdina, M. (1985). Heavy metals in marine organisms. SympBiolHung, 29, 141–151. Nelson, G.C. (2005). Drivers of ecosystem change: Summary chapter. In Island press (Ed).Ecosystems and human well-being (pp. 73-76).Washington, USA. Roberts, L., Brower, A. L., Kerr, G. N., et al. (2015). The nature of wellbeing: how nature's ecosystem services contribute to the wellbeing of New Zealand and New Zealanders. Department of Conservation (Ed). Zarazúa, G., Tejeda, S., Ávila, P., et al.(2011). Metal content and elemental composition of particles in cohesive sediments of the Lerma River, Mexico.RevistaInternacional de ContaminaciónAmbiental, 27(3), 181-190. Kong, P., Cheng, X., Sun, R., Chen, L. (2018). The Synergic Characteristics of Surface Water Pollution and Sediment Pollution with Heavy Metals in the Haihe River Basin, Northern China. Water, 10,73. Matte, T.D. (2003). Efectos del plomoen la salud de la ni-ez. SaludPública Mexicana, 45(2), 220-224. Rainbow, P.S. (1992). The significance of accumulated heavy metal concentrations in marine organisms. In: Miskiewicz AG (Ed). Assessment of the distribution, impacts and bioaccumulation of contaminants in aquatic environments, Proceedings of a bioaccumulation Workshop. Sydney. Water Board and Australian Marine Science Association Inc.
Acosta, V., C, Lodeiros., W, Senior. (2002). Niveles de metalespesadosensedimentossuperficialesentres zonas litorales de Venezuela. Interciencia, 27, 686-690. Rather, B.A., Franson, J.C., Sheffield, S.R., Goddard, C.I., Leonard, N.J., Stand, D., White, P.J. (2008). Sources and Implications of Lead-based Ammunition and Fishing Tackle on Natural Resources. The Wildlife Society, Bethesda, MD, USA. Zaza, S., de Balogh, K., Palmery, M., et al. (2015). Human exposure in Italy to lead, cadmium and mercury through fish and seafood product consumption from Eastern Central Atlantic Fishing Area.Journal of Food Composition and Analysis, 40, 148-153. Barlas, N., Akbulut, N., Aydogan, M. (2005). Assessment of heavy metal residues in the sediment and water samples of Uluabat Lake, Turkey. Bulletin of Environmental Contamination and Toxicology, 74, 286–293. Hall, L.W.J., Scott, M.C., Killen, W.D. (1997). A Screening Level Probabilistic Ecological Risk Assessment of Copper and Cadmium in the Chesapeake Bay Watershed. Report. US EPA (Ed), Chesapeake Bay Program office, Annapolis, MD. Martínez, G., Rodríguez, L., Senior, W. (2002). Especiación de Cd, Zn, Cr y Pbennúcleos de sedimentos de la Bahía de Bergantín, Estado Anzoátegui, Venezuela. Interciencia, 27, 173-178. Pedroza, S., Bussy, A., Barceló, I., López, E., Ávila, P. (2010). Organic matter biodegradation and metal behavior in contaminated freshwater sediments. International Journal of Environmental Technology and Management, 12(1), 85-94. Sprague, D.D. and Vermaire, J.C. (2018). Legacy Arsenic Pollution of Lakes Near Cobalt, Ontario Canada: Arsenic in Lake Water and Sediment Remains Elevated Nearly a Century After Mining Activity Has Ceased. Water Air and Soil Pollution, 229, 87. Bahloul, M., Baati, H., Amdouni, R., Azri, C. (2018). Assessment of heavy metals contamination and their potential toxicity in the surface sediments of Sfax solar Saltern, Tunisia. Environmental Earth Sciences, 77,27. Urbina-Barreto, I., Hernandez-Valencia, I., Villamizar, H., Alvarez, M. (2014). Concentraciones de Pb, Cd, Ni, Cr y Cu enAmphimedonViridis y Niphateserecta (haplosclerida: Nephtyidae) en dos ecosistemasmarinos del mar Caribe venezolano. SociedadVenezolana de Ecología, 27(1-2), 31-39. Khan, M. I., Khisroon, M., Khan, A., et al. (2018). Bioaccumulation of Heavy Metals in Water, Sediments, and Tissues and Their Histopathological Effects on AnodontaCygnea (Linea, 1876) in Kabul river, Khyber Pakhtunkhwa, Pakistan. Biomed Research International. Atef El-Taher, Hesham M.H. Zakaly and RedaElsaman. (2017). Environmental implications and spatial distribution of natural radionuclides and heavy metals in sediments from four harbors in the Egyptian Red Sea coast, Applied Radiation and Isotopes. Moiseenko, T.I. et al. (2018). Ecosystem and human health assessment in relation to aquatic environmental pollution by heavy metals: case study of northwest of the Russian arctic, Kola peninsula. Environmental Research Letters in press. Pulich, M. W. (1980). Heavy metals accumulation by selected HaloduleWrightii ASH populations in the Corpus Christi Bay Areas. Marine Science, 23, 89-100. González-Lozano, M.C., Méndez-Rodríguez, L.C., López-Veneroni, D.G., Vázquez-Botello, A. (2006). Evaluación de la contaminaciónensedimentosdeláreaportuaria y zona costera de Salina Cruz, Oaxaca, México. RevistaInterciencia, 31(9), 647-656. Aragon, M., Félix, F., García, J., Rivas, D. (2015). Atlas de Sonora de Julio MontanéMartí. In InstitutoSonorense de Cultura (Ed). Gortares-Moroyoqui, P. (2010). Microbiological Water Quality in Irrigation Water, Treated Wastewater, and Untreated Wastewater and Its Impact on Vegetables in Sonora, Mexico. Doctor of Philosophy Thesis. The University of Arizona. Acosta-Velázquez, J. and A. D. Vázquez-Lule. (2009). Caracterización del sitio de manglar Estero Los Lobos, enComisión Nacional para el Conocimiento y Uso de laBiodiversidad (CONABIO). Sitios de manglar con relevanciabiológica y con necesidades de rehabilitaciónecológica. CONABIO, México, D.F. Vargas-González, H.H., Arreola-Lizárraga, J.A., García-Hernández, J., et al. (2017). Calidad de sedimentosasociada a actividadesantrópicasenlagunascosterassemiáridassubtropicales de la costa central delGolfo de California. RevistaInternacional de ContaminaciónAmbiental, 33, 7-22. Ortega, P., Vásquez, D. (1992). Distribución y enriquecimiento de metalestrazaennúcleos de sedimento de tressistemascosterosdelestado de Sonora, México. ActaOceanográficadelPacífico, 7(1), 111-127. García-Rico, L., Soto-Cruz, M.S., Jara- Marini, M.E. and Gómez-Álvarez, A. (2004). FraccionesGeoquímicas de Cd, Cu y PbensedimentosCosterosSuperficiales de Zonas Ostrícolasdel Estado de Sonora, México. RevistaInternacional de ContaminaciónAmbiental, 20(4), 159-167. Norma Oficial Mexicana NOM-059-SEMARNAT-2010. (2010). Protección ambiental-Especies nativas de México de flora y fauna silvestres-Categorías de riesgo y especificaciones para sin inclusión, exclusión o cambio-Lista de especies enriesgo. Diario Oficial de la Federación, 30 de diciembre del 2010. Plus, M. S. (2001). version 5.1 for Windows. Rockville: Manugistics Group. Pérez-Zapata, A.J. (1981). Plomo y mercurio: Lagunas costeras de Tabasco. Centro de Ecodesarrollo (Ed). Unecosistemaenpeligro (pp. 58-61). México. EPA (Environmental Protection Agency). (2013). Aquatic Life Water Quality Criteria Summary. In State of Oregon: Oregon Department of Environmental Quality. Buchman, M.F. (2008). NOAA Screening Quick Reference Tables, NOAA OR&R Report 08-1. Seattle WA. Office of Response and Restoration Division, National Oceanic and Atmospheric Administration. CONAGUA (Comisión Nacional del Agua). (2016). Reporte del climaen México.